Two heavy vehicle automotive Charles Darwin University-trained apprentices from Alice Springs will represent the Northern Territory in a national automotive diagnostic competition. James Berry and Ricky Martin, both second year apprentices, scored top marks in an online national apprentice challenge sponsored by Commercial Vehicle Industry Association of Queensland. They will fly to Brisbane for the national tour on May 17, working together to solve truck ‘faults’ against teams from around Australia. CDU VET automotive lecturer John Mason said the students excelled in the competition. ‘These are second-year apprentices who have beaten third and forth year students, so it’s an excellent result,’ he said. James Berry said the online challenge was difficult, but believed the teaching at CDU and exposure at his current workplace gave him an advantage. ‘The online test covered engine management, electrical, air conditioning systems, steering, suspension and brakes,’ he said. 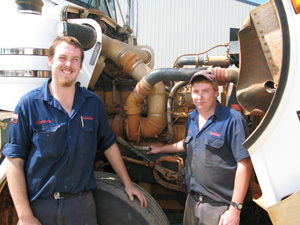 Both work for Western Diesel, Alice Springs, servicing and maintaining heavy vehicle equipment, including trucks, tractors and earthmoving equipment. Manager Matt Ashton said both young men were among the best apprentices in Alice Springs.